An image taken from Google Maps shows the location of Shooting Island in the back bay off Ocean City. 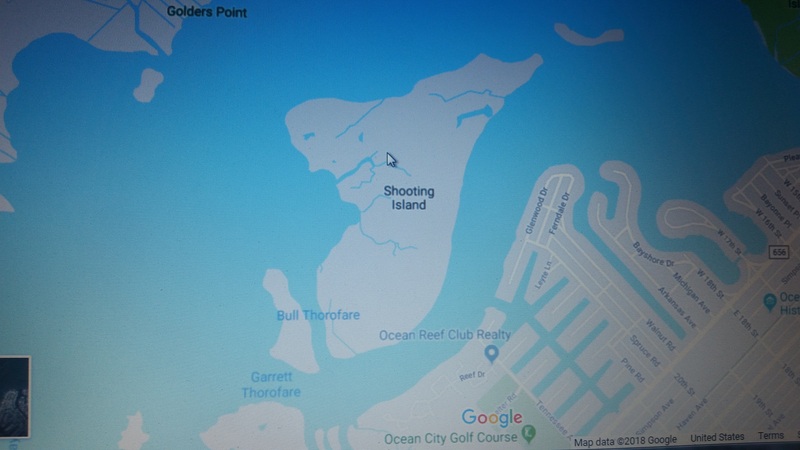 The City of Ocean City is proposing a living shoreline project for wetland restoration/enhancement and shoreline restoration of the 1978 shoreline on Shooting Island, a bay island located in the Cape May Wetlands Wildlife Management Area in Great Egg Harbor Bay, Cape May County New Jersey. The project is intended to enhance the coastal resiliency and result in a reduction of storm impacts. The island has experienced significant degradation for more than 80 years and, in some areas, the shoreline has receded up to 60 feet. More than 150 acres of tidal wetlands will be restored and protected. The project includes two main components: 1) construction of approximately 3,200 linear feet of living shoreline rock sill to protect existing marsh and allow for further development of marsh on the island; and 2) construction of approximately 1,900 linear feet of living shoreline using oyster habitat components. A public meeting will be held from 4 p.m. to 6 p.m. on July 24, 2018 in Council Chambers at City Hall, 861 Asbury Avenue, Ocean City, New Jersey.